The Great Beauty (Italian: La grande bellezza [la ˈɡrande belˈlettsa]) is a 2013 Italian black comedy drama film co-written and directed by Paolo Sorrentino. Filming took place in Rome starting on 9 August 2012. It premiered at the 2013 Cannes Film Festival where it was screened in competition for the Palme d'Or. It was shown at the 2013 Toronto International Film Festival and at the 2013 Reykjavik European Film Festival. The film won Best Foreign Language Film at the 86th Academy Awards, as well as the Golden Globe and the BAFTA award in the same category. It is a co-production between the Italian Medusa Film and Indigo Film and the French Babe Films, with support from Banca Popolare di Vicenza, Pathé and France 2 Cinéma. With a production budget of €9.2 million, the film has so far grossed over $24 million worldwide. 4 Mueve la colita 2-17 El Gato D.J. The review aggregator website Rotten Tomatoes reported a 91% approval rating, based on 113 reviews, with a weighted average rating of 7.8/10. The critical consensus states, "Dazzlingly ambitious, beautifully filmed, and thoroughly enthralling, The Great Beauty offers virtuoso filmmaking from writer/director Paolo Sorrentino." The film holds a score of 86/100 on Metacritic based on 34 reviews, signifying "universal acclaim." Robbie Collin at The Daily Telegraph awarded Sorrentino's film the maximum five stars and described it as "a shimmering coup de cinema". He likened it to Roberto Rossellini's Rome, Open City and Federico Fellini's La Dolce Vita in its ambition to record a period of Roman history on film. "Rossellini covered the Nazi occupation of 1944; Fellini the seductive, empty hedonism of the years that followed. Sorrentino's plan is to do the same for the Berlusconi era," he wrote. Deborah Young of The Hollywood Reporter stated "Sorrentino's vision of moral chaos and disorder, spiritual and emotional emptiness at this moment in time is even darker than Fellini's (though Ettore Scola's The Terrace certainly comes in somewhere)." Critics have also identified other purposefully explicit film homages: to Roma, 8½, Scola's Splendor, Michelangelo Antonioni's La notte. Spanish film director Pedro Almodóvar named the film as one of the twelve best films of 2013, placing it second in his list. Various critics named the film as one of the best of 2013. 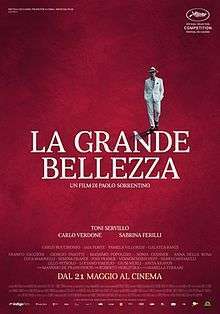 ↑ "La grande bellezza - MYmovies". Mymovies.it. 2013-05-21. Retrieved 2014-04-12. ↑ Boxoffice Media, Llc (2013-11-15). "BoxOffice® — The Great Beauty". Boxoffice.com. Retrieved 2014-09-23. ↑ "Festival de Cannes. Official Selection 2013: In Competition". Cannes. Retrieved 2 November 2013. ↑ "Toronto film festival 2013: the full line-up". The Guardian. London. 23 July 2013. Retrieved 24 July 2013. ↑ "Oscars 2014: Full list of winners". BBC News. 3 March 2014. Retrieved 2014-03-03. ↑ De Marco, Camillo (18 September 2012). "La grande bellezza by Paolo Sorrentino sold in six countries". cineuropa.org. Cineuropa. Retrieved 3 March 2013. ↑ "The Great Beauty (La Grande Bellezza)". Screenbase. Screen International. Retrieved 3 March 2013. ↑ De Marco, Camillo (21 May 2013). "The Great Beauty: a journey to the end of the night". Cineuropa. Retrieved 1 November 2013. ↑ Simek, Peter (December 12, 2013). "Why The Great Beauty Is One of the Best Films You'll See All Year". D Magazine. Front Row (blog). Retrieved 2013-12-21. ↑ Collin, Robbie (December 20, 2013). "Film review of the year 2013: 'This was the greatest year of cinema since 1999'". The Daily Telegraph. London. Retrieved 2013-12-21. ↑ Turan, Kenneth (November 21, 2013). "Review: 'The Great Beauty' intoxicates with masterful Toni Servillo". Los Angeles Times. Retrieved 2013-12-21. ↑ Order of appearance in the film's closing credits. '–' indicates original music by Lele Marchitelli, individual tracks not credited in the film. ↑ CD and track number from 2-CD original soundtrack album, Indigo Film IND009. '–' indicates tracks not included in the album. ↑ "The Great Beauty (2013)". Rotten Tomatoes. Warner Bros. Retrieved 12 February 2014. ↑ "The Great Beauty". Metacritic. CBS Interactive. Retrieved 12 February 2014. ↑ Collins, Robbie (22 May 2013). "The Great Beauty, review". The Daily Telegraph. London: Telegraph Media Group. Retrieved 1 November 2013. ↑ Young, Deborah (21 May 2013). "The Great Beauty: Cannes Review". The Hollywood Reporter. Prometheus Global Media. Retrieved 1 November 2013. ↑ Boni, Federico (21 May 2013). "The Great Beauty: Sorrentino's Masterpiece". swide.com. Retrieved 2 November 2013. 1 2 Tookey, Chris (5 September 2013). "The Great Beauty of this film is the images of Rome and Italy, not the story". Mail Online. London: Daily Mail and General Trust. Retrieved 2 November 2013. ↑ Weissberg, Jay (20 May 2013). "Cannes Film Review: The Great Beauty". Variety. Penske Media Corporation. Retrieved 2 November 2013. ↑ "Pedro Almodovar's Top 12 Films Of 2013 Includes 'Blue Is Warmest Color,' 'Mud,' 'Act Of Killing'& More". Indiewire. 11 December 2013. Retrieved 11 December 2013. ↑ Out, Time (2013-12-11). "Best films of 2013 – Time Out Film – Time Out London". Timeout.com. Retrieved 2014-04-12. ↑ Film (20 December 2013). "Film: the best and worst of 2013". London: Telegraph. Retrieved 2014-04-12. ↑ Brooks, Xan (2013-12-19). "The 10 best films of 2013, No 2 – The Great Beauty | Film". The Guardian. Retrieved 2014-04-12. ↑ "dagospia". dagospia.com. Retrieved 2014-04-12. ↑ "Gravity is Chris Vognar's No. 1 movie of the year. What else made the Top 10?". Dallas Morning News. Retrieved 20 December 2013. ↑ Leo Barraclough (2013-11-29). "Sight & Sound Names 'Act of Killing' Top Film of 2013". Variety. Retrieved 2014-04-12. ↑ Schwarzbaum, Lisa (2014-03-02). "Culture - The 10 best films of the year". BBC. Retrieved 2014-04-12. ↑ "AP's Top 10 2013 Movies Include 'This Is The End,' 'Mud'". The Huffington Post. 16 December 2013. Retrieved 20 December 2013. ↑ Holden, Stephen (12 December 2013). "The New York Times". nytimes.com. Retrieved 2014-04-12. ↑ "New York - The 2013 Village Voice Film Critics' Poll". Villagevoice.com. 2014-04-04. Retrieved 2014-04-12. ↑ "The Best Movies of 2013". The Diamondback. Retrieved 20 December 2013. ↑ "A Field In England, Filth, Blue Is The Warmest Colour, All Is Lost, Upstream Colour | The 50 Best Films Of 2013 | Features | Empire". Empireonline.com. Retrieved 2014-04-12. ↑ 16.46 GMT (2014-03-13). "The Braddies 2013: Peter Bradshaw nominates his films of the year | Culture". The Guardian. Retrieved 2014-04-12. ↑ Scott Foundas Chief Film Critic @foundasonfilm (2013-12-13). "Best Movies of 2013: Scott Foundas' Top 10". Variety. Retrieved 2014-04-12. ↑ Justin Chang Chief Film Critic @JustinCChang (2013-12-13). "Best Movies of 2013: Justin Chang's Top 10". Variety. Retrieved 2014-04-12. ↑ Nordyke, Kimberly (March 2, 2014). "Oscars 2014 Winners: The Complete List". The Hollywood Reporter. Retrieved March 9, 2014. ↑ "Golden Globes Nominations: The Full List". Variety. January 11, 2014. Retrieved March 10, 2014. ↑ "Golden Globe Awards Winners". Variety. January 12, 2014. Retrieved March 10, 2014. ↑ "Bafta Film Awards 2014: Full list of winners". BBC. February 16, 2014. Retrieved March 9, 2014. ↑ "IOFCP 2013-2014". January 26, 2015. Retrieved February 2, 2015. ↑ Richford, Rhonda. "Berenice Bejo, Lea Seydoux, Roman Polanski Among France's Cesar Awards Nominees". Hollywood Reporter. Retrieved 1 February 2014. ↑ "Uudised - Festival - Pimedate Ööde Filmifestival 15. nov - 1. dets 2013". 2013.poff.ee. Retrieved 2014-04-12.